Bella Viva Orchards is a family owned company out of Northern California that prides itself on providing exquisite fresh and dried fruits, nuts, and chocolate. Bella Viva means beautiful long life in Italian and the Martino family that runs Bella Viva Orchards named their company after their two daughters Vivian and Belle. You can find a little of everything gourmet at the Bella Viva website. Bella Viva also has a wonderful array of gift baskets for every special occasion! As a fan of dried fruit, I was very excited to have the opportunity to review Bella Viva Orchards' Mixed Dried Fruit 1 lb. bag. This mix comes with a little of everything, including: Apricots, Peaches, Plums, Pears, Apples, and Nectarines. I love the large pieces of dried fruit that come in this bag. I'm used to the smaller pieces you get in traditional grocery store brand mixes, but this was great! 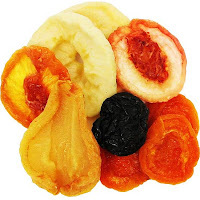 These dried fruits were absolutely delicious and of course my kids wanted a taste, so I shared. We all agreed that Bella Viva Orchards' dried fruits are truly tasty and I am so glad to have had a chance to discover this company and what they have to offer. I would recommend heading over to the Bella Viva website to see everything this company has to offer!